So I got a little bored today and decided to build a small CYOA engine, which is basically a parser for the way I structure my concept files. It’s not very powerful, probably has a whole bunch of limitations, but it works and you can play around with it too! 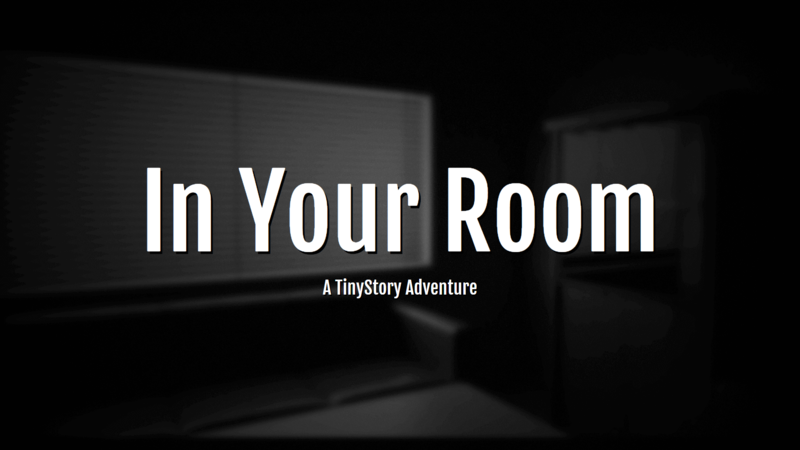 So check out TinyStory on GitHub and play the sample game In Your Room here! If you happen to create something with it, feel free to show it to me! And of course I’m always interested in feedback. It probably isn’t going to grow very big, but I’ll likely extend it at least a little bit as I keep playing with it. But now I had the bright idea to give that old thing a proper overhaul, to remix, remaster, and release it a little more officially for its 5th birthday – which, incidentally, is also the 10th anniversary of my making music under the Bob Roberts name! How fun is that! You can also check out a number of other ways to listen and get it on the official website. So give it a listen, tell your friends, and if you feel like kicking a few bucks my way, it’d be much appreciated! SPOILER WARNING: This is my rant about why I hated the ending to Fantastic Beasts and Where to Find Them, and I intend to spoil all of it. So I went to see Fantastic Beasts and Where to Find Them last night, and I had a great time. It’s well cast, well shot, and above all genuinely sweet, funny, and indeed quite tense when it needs to be. I was at the edge of my seat one moment and dying from laughter the next. I guess one more couldn’t hurt, if only because this has been a surprising amount of work. Remember when I went on and on about streaming and playing OGGs and stuff? Well, that’s about all I managed to get done this week, and since this is all sound, we’re once again left without another slight variation in the same dreary screenshot. But done it got, no longer forcing you to have uncompressed audio taking up lots and lots of space on both disk and memory. It’s not even too hard to set up as OpenAL handily provides the functionality to queue and play buffers. If you ask nicely, it’ll also tell you if it’s done with one or more of those, leaving only the refilling and queuing of the next chunks up to you. And with that brilliant pun another week has passed and we’re back again, for the 7th installment and 4th time since I proclaimed I’d stop writing about this boring nonsense, striking a perfect balance in keeping me motivated without making it feel like an obligation. Mh, exposition. Yes! Physics! Now all I need to do is figure out how physics actually work! Now, of course we saw the lil’ guy moving already, but what’s moving without walking, I ask you! (It’s gliding.) 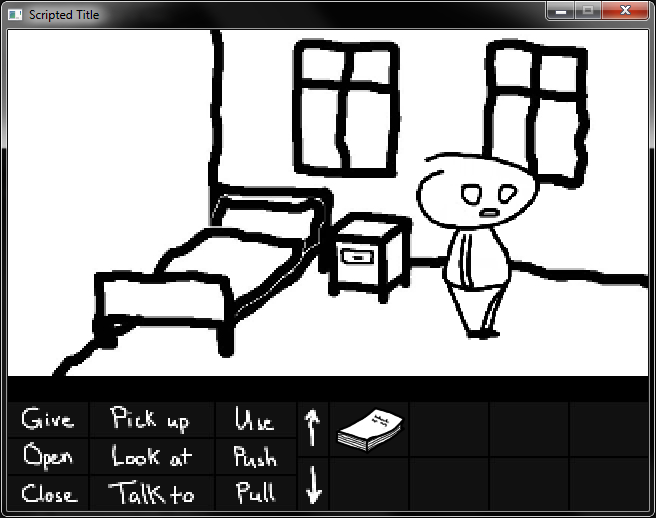 So naturally that had to be remedied, with a brand new animation system at that! Just look at him go! And just like that we have movement that only required some care during recording in oder to not make it look as awful as that code allows! Look at that, it’s been precisely a week and already there’s enough to talk about to sorta-justify another one of these thinly-veiled excuses to slowly move my blog away from all the serious seriousness of The Day to something a little more lighthearted and fun in the hopes that I can one day talk about cooking and movies without it being too jarring a change in tone. Yeah it is! Especially since I just realized that it’s been more than 5 years since I last took the time to get cracking on something overly complicated and wholly unnecessary for which already established and infinitely better solutions exist and have existed for just about forever! Boy, do I miss those days… And so, in order to treat myself during these trying times, I’ve decided to give OpenGL another go. And when I say another, I mean I’ve glanced at it briefly while altering a friend’s code just enough for me and my roommate to pass a uni assignment without getting caught. Which we didn’t, so I guess moving that sphere a little to the left and rendering it in wireframe did the trick. Content Note: This post discusses The Day the Laughter Stopped. The usual trigger and spoiler warnings apply. A few weeks back, after we released The Day, I was approached about writing a little something on my journey from ignorant douchebag to slightly-less-ignorant douchebag. Seems like a good topic to start off this brain dump thingy, so I’m more than happy to oblige.